If you’re new here, this is week 5 of my Leaky Gut Repair Protocol. It includes a strict elimination, autoimmune paleo diet in conjunction with Apex Energetics, Repairvite supplements. 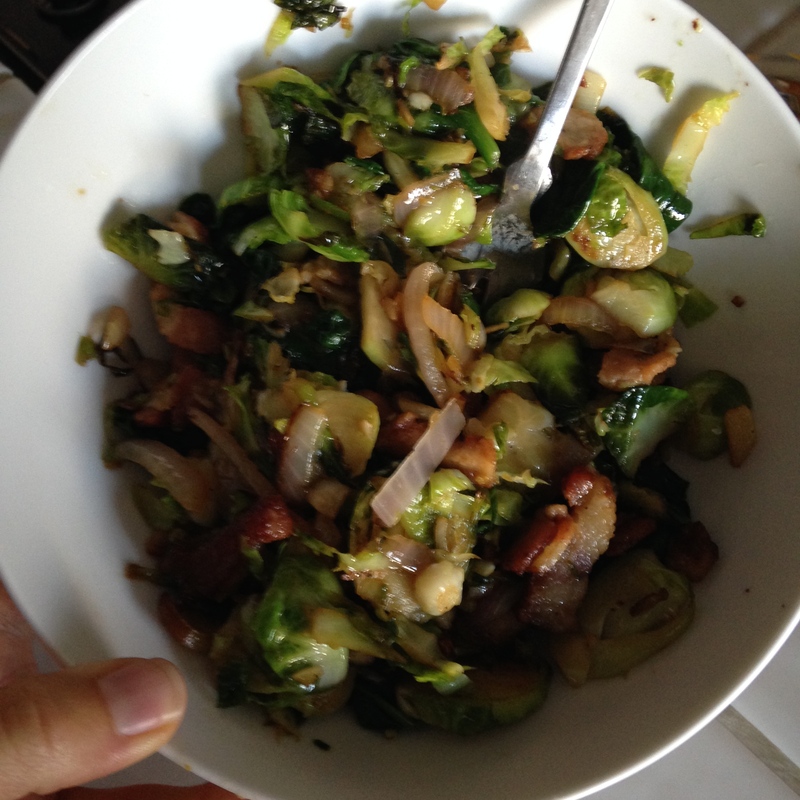 My new favorite breakfast is Brussel Sprouts and Bacon. I’m back to being relatively “OK” with the restrictive nature of this diet. Every once in a while I really wish for a banana or some chocolate…. but all in all, not too difficult to work around the food issue. I definitely haven’t been hitting up any restaurants. I’ve brought my food to the past 2 food outings with friends. Sure, it feels a bit weird opening up my tupperware at a restaurant… but for those of you who feel like you would DIE from the awkwardness… it’s really not that bad. It’s easier than sitting there without any food at all. I just restocked some of the supplements, which makes me happy because it means that a lot of time has passed…. which means I’m closer to the end. I still forget to take the GI Synergy a lot of the time. I’ve also added some GABA to the rotation, and I’ve been taking a swig of aloe vera juice here and there. I can definitely feel that my back is straighter. I notice it mostly when I do the whole “rock back” thing in yoga. I can feel my spine articulating a lot more evenly on the ground. Sounds weird, but when you’ve been doing something like that for so long, it’s easy to notice when something feels “different”. In a skillet add meat and cook down until the grease spreads throughout the pan. Add onion and brussel sprouts. Mix everything together and let it sauté for a bit. Stirring infrequently. You want to let everything sit for a while so that the brussels begin to brown a bit. After stirring a couple of times, add garlic and spinach. Continue to cook until meat is done and brussels have browned to your desire. Then eat with joy and gratitude.